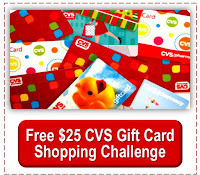 I had another good week on my $25 CVS Gift Card Challenge with my free $25 CVS gift card from Swagbucks! ...well, except for not getting any ECBs-haha! Seems the whole system was down, so they couldn't even force them to print, but they made notes on my receipts and promised to print them when I bring the receipts back in and the system is back up. So I cut out the deals from the ad (so they'd have the code to print the ECBs) and attached the receipts to them, and put them with my shopping stuff so I remember to take it next time. & from Saving Star should get back: $1 on the L'Oreal, that coupon is no longer available to link to your card, that's why I link mine as soon as I see one I think I'll want so it is ready when the deal comes. Everything except the toothpaste counts towards CVS Beauty Club (spend $50 get $5 ECB). This is shopping trip #6 in my CVS gift card challenge. My $25 CVS gift card earned on Swagbucks plus extra bucks and cash back earned on purchases made with it total $42.19 worth of CVS spending power. And I've brought home $164.94 in products. See the spread sheet below for details of my current totals [note: $4 cash back is what I will receive from SavingStar].